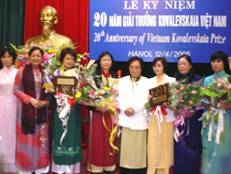 In the morning of 12th April 2005, the Vietnam Women’s Union and the Vietnam Committee for Kovalevskaia Prize organized the 20th years anniversary of the Vietnam Kovalevskaia Prize foundation. In the remark speech, Madame Nguyen Thi Binh emphasied:”Since its establishment (1985-2005) Vietnam Committee for Kovalevskaia Prize has selected and awarded Kovalevskaia Prizes to 28 outstanding individuals and 12 outstanding groups of the women scientists in Vietnam. The value of the Prize is not much, however it encourages and stimulate Vietnamese womenscientists and increases the pretisge of science performance of Vietnamese women to the world”. President HaThiKhiet gives flowers to Madame Nguyen Thi Binh and Mr. & Mrs. Ann Koblitz. Kovalevskaia Prize bears the name of the eminent Russian Doctor Mathematician, the greatest female scientist of the 19th Century- Sophia Kovalevskaia. Kovalevskaia Prize was founded with the initial financial contribution from the Prof.Doctor Ann Koblitz (An American) and her husband Prof.Doctor Neal Koblitz. Since 1985, Mr. and Mrs.Ann Koblitz selected women scientists in <?xml:namespace prefix = st1 ns = "urn:schemas-microsoft-com:office:smarttags" />Vietnam who work in the field of natural science as a target group to consider and award Kovalevskaia Prize. Right after being born, Kovalevskaia Prize has been actively responded by the women scientists and considered as the source of encouragement to their work in scientific studies and application to reality. 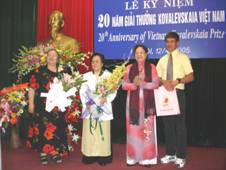 On this occasion, Vietnam Committee for Kovalevskaia Prize organizes the ceremony to award Kovalevskaia Prizes in 2003-2004 to 2 individuals and 2 groups of women scientists who have gained the outstanding achievements in the field of natural science. They are: Prof.Dortor and outstanding teacher Tran Thi Luyen- Vice director of Nha Trang Aquaculture University; Colonel, Associate Prof. Nguyen Thi Thu Ha, Head of Hematology Faculty of the Central Army Hospital 108, Ministry of National Defense; Two women scientists groups of the Polymer Pharmaceutical Unit, Chemical Institute, Vietnam Institute for Science and Technology and of Traphaco Share-Stock Company.